This post is inspired by a question from Deborah on our facebook page: “Which of the [Disney Vacation Club] resorts offer a counter service breakfast?” The quick answer is that you can get a quick breakfast at all of them; you just have to know where to go. I’m a food snob – there, I said it. The Burger Kings of the world aren’t getting rich off of me. I like good food and I’m happiest when someone is placing it on the table for me. So, of course, I am like a kid in a candy store when I am at Walt Disney World. I eat most of my lunches and dinners at the sit-down restaurants – I am on vacation after all. But breakfast is a different story. I’m not a big fan of breakfast foods. Give me a granola bar and a cup of coffee and I’m good to go. If you’re like me and prefer just a little something light or quick for breakfast, here’s a list of options for each of the DVC resorts. 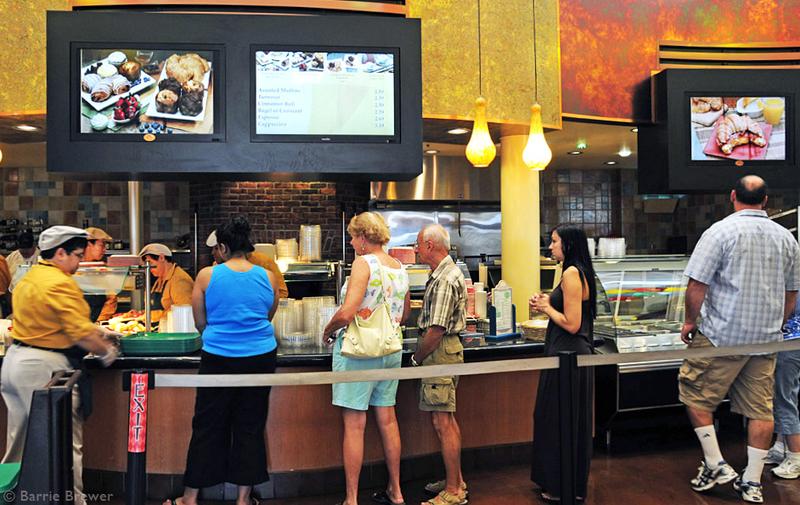 The Mara is a quick service restaurant on the ground floor of Jambo House, near the pool. Breakfast options include an African-inspired breakfast platter, scrambled eggs, Mickey waffles, potatoes, bacon, sausage, breakfast sandwiches, pastries, cereals, juices and smoothies. 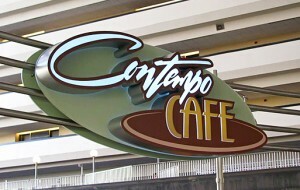 Contempo Café is in the lobby of the Contemporary Resort, a quick walk from Bay Lake Tower. A nice thing about this quick-service restaurant is that it is open 24-hours. For breakfast they offer waffles, eggs, bacon, turkey sausage, potatoes, French toast, biscuits, bakery items, fruit, breakfast burritos and breakfast sandwiches. I think the Beach Club Marketplace is a little hidden gem. I often stop in there for a quick bowl of soup – one of the best values on property. It’s a little tricky to find though because the Marketplace is the general store for the resort, with a food counter located inside. The breakfast menu here is truly grab and go – breakfast sandwiches, French toast sticks, yogurt parfait, hard-boiled eggs, fruit, and espresso. You’ll find a few tables just outside of the Marketplace, on the walkway between the Villas and the main resort. At the Boardwalk Villas there are actually two choices for quick-serve breakfast. It turns out that my favorite place to partake in a refreshing adult beverage in the evening, the Belle Vue Lounge, also serves up a continental breakfast in the morning. Located between the lobby and the Inn, the Belle Vue is a comfy lounge tucked into the alcove above the steps leading down to the Boardwalk. Along with milk, juice, coffee and tea you can get cereal, a bagel, muffin, Danish, croissant, yogurt parfait and fruit. As I said, I do love the Belle Vue, but for breakfast my choice would have to be the Boardwalk Bakery. 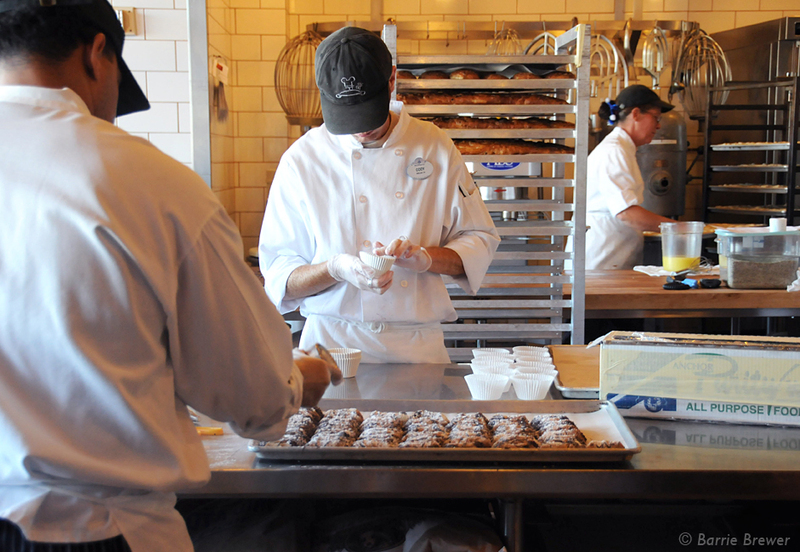 Located between Kouzzina and the ESPN Club, the bakery is a perfect place to stop on your way to Epcot. There are the usual breakfast sandwiches, bagels and yogurt parfaits, but the stars of the show are the fresh baked pastries. Dessert for breakfast – a genius came up with that idea! Next stop, Old Key West, where Good’s Food to Go counter service adds grits and cinnamon sticky buns to its menu of the usual quick serve items. Good’s can be found outside of the Hospitality House, near the pool. At Saratoga Springs, Artist’s Palette is the quick service option. Closer to a café than a counter service, Artist’s Palette has more to offer than just pastries and breakfast sandwiches. Along with the usual baked goods and fruits you’ll find waffles, omelets, breakfast platters and breakfast flatbread. Artist’s Palette resides inside the Carriage House, near the Turf Club Bar and Grill. Located near the Silver Creek Springs pool, Roaring Fork serves up waffles with a variety of delicious toppings – like maple butter with candied pecans and warm bananas in a buttered rum-flavored sauce. This counter service restaurant also adds pancakes, grits, and bacon to its menu of breakfast staples like pastries and breakfast sandwiches. So there you have it. If you’re in a hurry to get to the parks and you just want something quick and light for breakfast, you can always find something good to eat at your resort. I haven’t listed every single item available at each one but, hopefully, I’ve given you enough of a sampling to get a feel for the place. Our friends at AllEars.net do have up-to-date menus for all of the restaurants at Walt Disney World though.